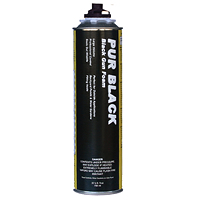 The PUR Black Foam from Todol Products is a low expansion, closed-cell foam that is ideal for sealing air leaks. The color of the foam is black, which allows it to blend perfectly outdoors. It can be used to seal cracks and gaps in large rooms such as basements and attics as well as on smaller surfaces such as doors and windows. This foam must be applied with a foam applicator gun. Each can contains enough foam to cover 2,820 cubic inches, or 1,200 linear feet when applied at 1/2” bead. It is tack free in ten minutes and can be trimmed in thirty minutes.